Don’t Miss: Any of it – this is a fascinating and moving tour, especially for those of the Christian faith. The city of Fátima lies just north of the Algarve and is home to the Fatima Sanctuary, a spiritual centre for the Christian faith and a must-see when visiting Portugal. On the Fatima Pilgrimage Tour you’ll see the tombstones of Lucia, Jacinta and Francisco, visit the Chapel of Apparitions, the heart of the shrine and travel to the very place where Our Lady of Fátima appeared for the fourth time. 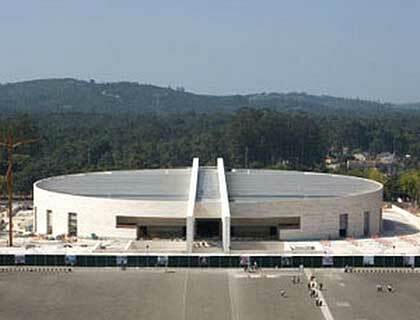 Visit the Fatima Sanctuary, a spiritual centre for the Christian faith. Visit the spot where the tombstones of Lucia, Jacinta and Francisco lie and house where they were born. Visit the Chapel of Apparitions at the heart of the shrine where you’ll have the chance to attend mass. See the site where Our Lady of Fátima appeared. Visit Loca do Anjo, where the children were visited by an Angel. This tour journeys to the city of Fátima, to re-live the history of the Fatima Sanctuary. The first stop on the Fatima Pilgrimage Tour will be at the Sanctuary itself, where the tombstones of Lucia, Jacinta and Francisco lie. To better understand the life of the 3 little pastors, you’ll also visit the house where they were born. The tour continues to the Chapel of Apparitions, which is the very heart of the shrine. Here everyone will have a chance to attend mass. Next you’ll journey on to Valinhos, to see the place where Our Lady of Fátima appeared for the fourth time on August 19th 1917. The final stop is Loca do Anjo, where you’ll see the place where the children, Francisco, Jacinta and Lucia, were visited by the Angel in 1916. Please Note: Shoulders and knees must be covered when entering religious buildings. Fatima Pilgrimage Tour is rated 4.0 out of 5 by 1. Rated 4 out of 5 by Peter D from Long day but worth it We had a nice day out to Fatima after an early start from the Algarve. Our tour guide was very knowledgeable. The day itself was 14 hours as it is a long drive and it would have been nice if we could have had another hour there. The bus had no toilet but it was comfortable.